Been tirelessly planning your wedding for months and see signs of anxiety manifesting around your eyes? Fine lines, dryness, dark circles, wrinkles, puffiness, and other eye-zone afflictions need powerful solutions and fast! 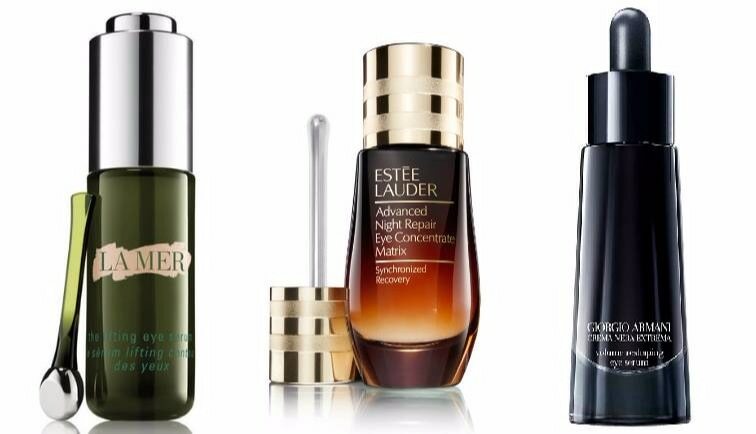 We have narrowed down 7 best luxurious eye serums targeted to solve each, few or all of your under eye issues. Take your pick. This luxurious eye cream contains a brightening formula that diffuses light for a golden glow to revitalise, hydrate, and smooth the delicate skin around your eyes. It hides imperfections, fine lines, dark circles, and irregularities; reducing any signs of stress and fatigue. This nourishing and strengthening serum comes with a custom-designed massage applicator. A high performance concentrate; it dramatically reduces lines, wrinkles, puffiness, and dark circles. While intensely nourishing the delicate skin around your eyes for a full 24 hours. Formulated without parabens, phthalates, sulfates; this silky eye serum not only promises but delivers. It uplifts, firms and rejuvenates the under eye area while also elevating the look of the entire eye area from lid to brow. The Crema Nera Extrema Volume Reshaping Eye Serum is actually an anti-aging serum but does so much more than that! It’s fresh and luminous texture intensely hydrates and makes skin around the eyes firm. Not just this, it uplifts the eyelids, reduces wrinkles, and fine lines. If you have sensitive skin and most harsh products take a toll on it, try this eye serum by Clarins. Made from organic harungana; it is gentle and effective and works on all visible signs of aging around the eyes. If you've been planning your wedding for months and the stress and fatigue shows around your eyes, this super serum is the solution to all your problems! With the power of Rose de Granville, it works on the entire eye area for a smoother, brighter look and feel; lightening marks of fatigue. Day after day, the eyes open up, magnified by greater lashes too! Can we ask for anything else? This luxurious multi-benefit eye cream works like magic on sagging under eye area, dark circles, dullness, and wrinkles with the help of Tormentilla and Licorice Extract. Illuminating Complex EX with precious silk and pearl elements helps to deliver powerful moisture and brightness around the eyes for a phenomenal, youthful glow. The specially-designed beauty massage tool is coated in pure platinum to increase surface circulation during massage and improve overall tone for more well-defined eye area contours.